I can't remember how long I have had all these marbles. They have sat on my bookshelves for a long time. Marbles remind me of being a child in Scotland when we would play "for keepsies" on manhole and drain covers. Marbles bring to mind the days of innocence when we played in the streets and alleys, games that would be so foreign to our children and grandbabies. Games that included two tennis balls and a brick wall with pavement. Skipping ropes, string and even Mom's old stockings were used in play. Songs and ditties were made up to accompany the rhythmic bounce of balls and ropes. Marbles were my favorite. I loved nothing better than beating the neighborhood boys at this game. I had "steelies" (really just ball bearings) that knocked the competition out of the game. Marbles were traded and used as kid currency. I counted my wealth by the size and number of my marbles back then. What I really like about marbles now are their colours and variety. If you really look at a "cats eye" marble it is beautiful. These tiny treasures on my shelf are not for my grandbabies to play with. There are marbles in the toy box for them. 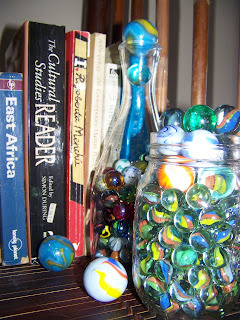 I really like my marbles...and am glad I still have them all. The reason I am putting this on the "new" blog is my children may see this and disagree. Well Glynis so I think...we are usually the last ones to know when we have a few marbles missing. I have not counted them in a while. Off I go to count. This article makes me pine for the 'good old days':) I have a few 'marble' memories. My great-grandma didn't have very many toys but as a wee girl I remember visiting her a few times before she passed away. She had marbles in all shapes and sizes, and in her cold sun-porch she stored a wooden marble-roller. No visit was complete without watching the gloriously colored marbles racing back and forth then pouring out at the bottom! !